The Organic Tippler: Mexican Style Quinoa and Blackbean Salad with wine! Mexican Style Quinoa and Blackbean Salad with wine! Spring hasn’t exactly been wowing me with her balmy days and nights, but I’ve decided it’s definitely time to embrace the salad once again. Yes, there have been some Ottolenghi cauliflower salads in there…but I thought I wouldn’t impose my love of cauli on you again. 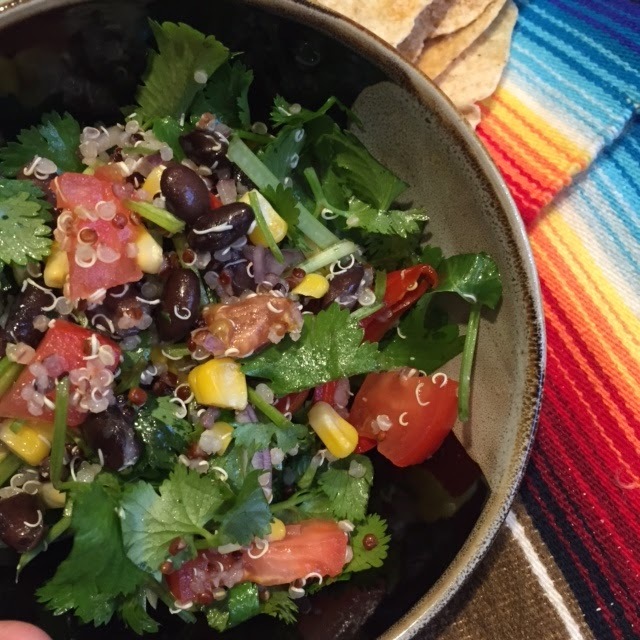 This time it’s the all delicious, all amazing QUINOA and BLACKBEAN MEXICAN SALAD! It’s absolutely scrummy as a side dish or as a stand alone meal, and it's VEGAN to boot! Half a cup of quinoa, rinsed and cooked as per the instructions to boil. 1 tin of black beans, drained and rinsed. 1 ear of corn, cooked and removed from the cobb. Salt, pepper, juice of ¼ of a lemon, ¼ teaspoon ground cumin and tablespoons of olive oil. Place sliced capsicum onto a tray, drizzle with olive oil and a pinch of salt. Roast in a hot oven until it is soft. Allow to cool. Cook quinoa in boiling water until soft, drain and cool. Combine all ingredients into a salad bowl. Combine olive oil, lemon juice, salt, pepper and cumin (adjust as you see fit) and dress the salad. I served mine with crisped up pita bread and a cracking glass of white, try the (also vegan) Spring Seed Semillon Sav Blanc for that hint of lemony mouth feel and lovely floral hints. You can buy it here. *** Vegans look away now: this salad is also awesome topped with some crumbly feta cheese and grilled prawns or white fish.